This may sound obvious, but sometimes I reread things simply because I want to feel a certain way. 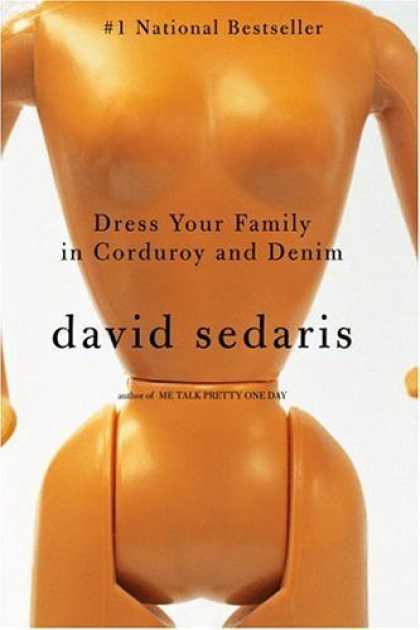 When it comes to Sedaris, my go-to piece is his short story, “Repeat After Me” from Dress Your Family in Corduroy and Denim. I’m happy to say the story is available for free online both to read and listen to, and I recommend you take ten minutes to check it out if you’ve never come across it before. As a writer, Sedaris is well-known his sense of humor, but I’ve always found his work to be more in the vein of tragi-comedy than anything else, and this story in particular wrecks me every time I read it. He’s not the person I go to when I want a good laugh; instead, I seek him out when I want to think about what it means to be a writer and a sister and a flawed individual all rolled into one. So much of his work is about his family or his personal life, and it’s painful to witness. Sure, I can laugh at some of it – he’s damn good at what he does – but more often, I sink into melancholy . All the best comedians are capable of manipulating me that way. The people I find the wittiest are also the sharpest and meanest and stupidest when it comes to the people they love. Those that choose humor as a career are often damaged and in need of a little extra care, and I love that about them. There is something remarkably powerful about a person so vulnerable who is also brave enough to stand up and declare himself a fool. It’s a gift to be able to spin pain into laughter, but it’s even more impressive to do it while retaining more than a shadow of excruciating truth. For more about David Sedaris, go here. I like the sound of the guys writing – will keep an eye out for his stuff. He has so many fantastic stories. I’m sure you’ll come across him again and I highly recommend his work. I’ve already headed over to check his stuff out. We’re all flawed individuals. It’s whether or not we’re willing to think about it that makes us different, I think. Thanks for the heads up! You’re welcome! Sedaris has such a witty way of dissecting some of life’s worst moments – it’s sort of impossible not to love him for that! You’ve convinced me to read David Sedaris – but also this review/whatever it is is beautifully and thoughtfully written, and I enjoyed reading it. Thanks! I hope you enjoy his work. He has such a wonderful gift, so I’m always happy to point new readers in his direction. I love David Sedaris. He definitely puts a humorous twist on tragedy. Great post. Doesn’t he? I’m amazed at how he manages to take the most heartbreaking moments and make me laugh…and then turns around and stabs the knife in again! The whole book is fantastic! I hope you enjoy it as much as I do! It really is fantastic. I’ve read a lot of his other work, but this book is definitely my favorite.